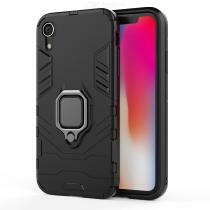 PC+TPU double layer material, advanced hybrid armor hard PC cover and impact resistant shockproof soft rubber bumper. With built in kickstand is convenient for reading, watching movies, playing games, browsing the web and facetime with friends. Innovational design provides quick and easy installation and removal without use of tools.